● High wind damage: Shingles may partially or completely tear away from your roof. You may notice roofing components are exposed such as the underlayment or roof deck. Winds may also cause shingles to curl. ● Hail: Hail damage can leave dents in the shingles. This will dislodge some of the granule, which is essential for protecting against rain and sun exposure. ● Lighting: Lightning damage isn’t always easy to notice. Since lightning brings a lot of heat, you may find imprint marks on the shingles. You may also find holes in the shingles. ● Take a look around your exterior and inspect damage with your gutters, windows, and siding. 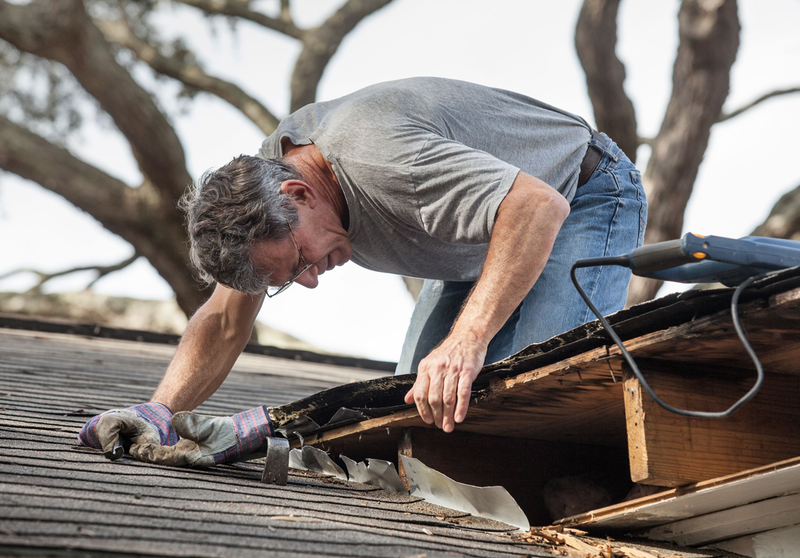 If there are dents in your gutters or window frames, your roof may be damaged as well. ● Check for fallen or loose tree limbs, which may have caused additional damage to your exterior. ● Not all roof damage from storms is on the exterior. Look for leaks inside of your attic, ceilings, and interior walls. ● If you notice storm damage, contact a roofing company that you can trust to discuss replacement (if necessary). Unfortunately, homeowners can fall victim to scams after strong storms come through the area. Storm chasers will come door to door soliciting services and offer to fix any damage that was done to your home. Many will require half or full payment upfront, which is when storm chases are infamous for disappearing into the night. You can avoid this situation by working with a reputable exterior company. Check online for reviews and be sure to ask for insurance information. You can always call the insurance company to double check that the company in fact has insurance coverage. While this is extra legwork on your end, it’s better to be safe than risking losing thousands of dollars. If you need your roof (or other exterior components) replaced after a storm, contact UWD today for an estimate.